As a young child, I had a sandbox in my backyard. I didn’t like our specific sandbox very much because the neighborhood cats often used it as a community litter box, and my parents didn’t like it because they had to kill off a plot of grass to build it. I loved the idea of a sandbox, though, and dreamed of building castles in it. You can roll the sandbox into your garage when not in use (keeping out unwanted cats and pests), wheel it onto a patio or grassy area when in use, and you can roll it over to a neighbor’s house for their children to use when your kids outgrow it. Just be sure to get locking wheels when you’re buying supplies so your child doesn’t roll on out of your yard while playing. What matters most to you? Let The Happiness Project Toolbox help you decide. Joie de vivre expert Gretchen Rubin, who authors the inspiring blog The Happiness Project, has recently launched a new website called The Happiness Project Toolbox. The Toolbox is a companion to her blog and is a way for people to create their own happiness projects. When you chose to become an unclutterer, you did so because you wanted to stop focusing on stuff and focus instead on what matters most to you. When you did this, you may not have formally created a list of what matters most to you. However, you knew that you wanted to get rid of the stress and frustrations in your home and office because there were/are other things that you would rather be doing with your time. The Happiness Project Toolbox is a resource to help you commit to writing those things that matter most to you. Specifically, the Resolutions, Personal Commandments, and Lists sections of the Toolbox can get you thinking about the things that you want to do more of and enjoy. Whatever these things are in your life, they can and will work as powerful motivators to keep you moving through the uncluttering process. When you have a clear idea of how you want your life to be, it’s easy to decide if an object, process, or behavior is useful or simply clutter in your life. While re-watching The Incredibles this past weekend, I noticed something particularly interesting about Bob’s cubicle workspace at Insuracare, where he worked as a claims adjuster. If you look at the back of his computer monitor, you will notice about 20 different cables coming out of the back. It’s amazing how such a small detail really adds to the feeling of bleakness in his job situation. If you’ll remember, the film was released over a year before Disney’s 2006 acquisition of Pixar, while Steve Jobs was still the Chairman and CEO, which almost leaves me wondering if the shot was some kind of subliminal attempt to sell us on the merits of the iMac and its single power cable (at least when used with a bluetooth mouse and keyboard). Can you think of any other scenes in movies where the disorganization of an environment is purposefully used to create a particular mood or sense of anxiety? Track your morning routine to find out what is keeping you from getting to work on time. With a simple move of the handle you can move up to five hot dogs at once! Skorpion24 finds a way to store more computers and peripherals a person could imagine in less than 20 sq. feet. Megan Drayton, founder and CEO of eChef Software, discusses the necessity that led her to create an organization product for all of her recipes. When my wife and I were planning the nursery we were inundated by so many items that we must have. You can prevent book clutter by asking yourself a few questions when you finish reading. Britney was on to something. Reader question: Which linens stay and which ones go? Tips to help you know which linens are good and which linens are clutter in your home. I’m sure I’ll get a bunch of comments from mango lovers telling me that they can’t live without their mango splitter, but I just can’t justify purchasing a tool to split a specific fruit. Clear clutter from your closet by participating in the Trash the Dress project. 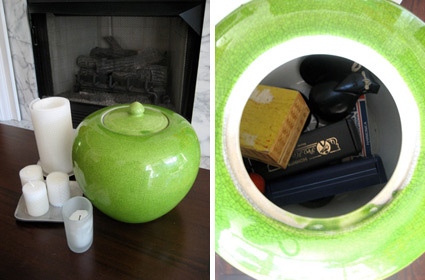 Clear the clutter from your medicine chest as a simple, weekend project! Keeping things clean can make your computer faster. Who knew? Reader Scott sent in this awesome foot-handled dustpan. If you use Gmail as your primary e-mail system (and I recommend that you do simply because of its powerful spam filter), then it’s time for you to become a Gmail Ninja. Google recently released four tip sheets to help you get your e-mail clutter under control with Gmail. The tip sheets come in four levels (white, green, black, and master) and are targeted to how many e-mails you receive a day (white being just a few messages a day, master being a “massive number”). Even if you only receive a dozen e-mails a day, it’s still beneficial to check out all four tip sheets for additional ideas. Set up filters to automatically label, archive, delete, star, or forward certain types of incoming messages. You can create a filter based on any message — just choose “Filter messages like this” from the “More actions” drop-down menu to get started. Using keyboard shortcuts will help you shave milliseconds off every action, which can add up to a lot of saved minutes each week. Enable keyboard shortcuts in Settings and use “j” and “k” to navigate up and down within your inbox, “o” to open messages, “r” to reply, “c” to compose, “s” to add or remove a star, “e” to archive, and more. Hit “?” at any time to see the reference guide with a full list of keyboard shortcuts. Turn on “Send & Archive” from the Labs tab under Settings, and you’ll see a new button that sends your replay and then archives the thread with one click. There is also a printable guide for easy reference while you’re in your e-mail inbox. Ask Unclutterer: Too much wine! I had a party and I bought a lot of wine for it–four cases–much more than I ended up needing. As guests arrived, they came bearing bottles of wine as hostess gifts–30 more bottles. Now I have more wine than I can store or possibly drink in a reasonable amount of time. I know a bit about wine, but a lot of the bottles I received as gifts aren’t ones I’ve tried before. How do I decide what to keep and what to get rid of? Also, what do I do with the bottles I don’t want to keep? I don’t want them sitting around my house cluttering up the kitchen, but I don’t want to waste them by throwing them away. I know it’s illegal for me to sell them. What should I do–oh gurus of simple living–with more than 60 bottles of wine? Jules, you have yourself in an interesting predicament. Let me begin by answering your question about which bottles to keep and which bottles to get out of your home. Log onto The Wine Buyer or a similar site and learn about the bottles of wine your friends gifted to you. (Your friends are good friends, by the way. I recommend keeping your friends.) Check out the ratings and the descriptions of the flavor for each bottle of wine. If what you learn about a wine interests you, put the bottle in your “keep” pile. If it doesn’t interest you, put it in a “purge” pile. I also recommend that as you’re reading about the wine that you write some notes for yourself about the bottles. These notes will be helpful in the weeks and months to come when you’re deciding what bottle of wine to pair with a meal or event. The bottles of wine that you bought for the party that you didn’t end up serving can most likely be returned to the store where you purchased them. Most stores will accept returns on any unopened reds and any unopened and unchilled whites (if you chilled it, it’s yours). Just be sure to take your receipt with you when you head back to the store. You could encourage another friend to have a party and donate all of your wine to him/her for the celebration. You can head to a local harbor and start christening ships (this is a joke, don’t do this, people will get mad). You could go door-to-door in your neighborhood and give wine to your neighbors as “thank you” gifts for putting up with the noise from your party. Dave, a knowledgeable gent who works at my local Total Wine, gave me a great suggestion for your “wounded soldiers” (those partially consumed bottles that are in the bar at the end of the party). Pour the remaining wine into ice cube trays, freeze, then pop the wine cubes out and store in ziptop plastic bags in your freezer. The next time a recipe calls for wine, drop in a frozen wine cube instead of opening a new bottle. Our readers may have more suggestions for what to do with the excess wine, so be sure to check the comments for more ideas. I’m sure that this is a predicament that non-drinkers run into from time-to-time. Not being able to sell the wine bottles you received as hostess gifts really does make things more difficult. Thank you, Jules, for submitting your question for our Ask Unclutterer column. 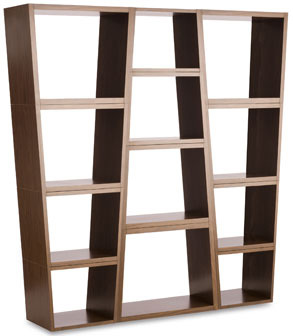 I used BESTA shelves and VIKA BYSKE legs, to create my ideal desk. The desktop is made from 2 hollow doors that I assembled, veneered, stained and varnished. The doors are IKEA TOMBO doors with a peacock wallpaper from Ferm Living. The Trollsta sideboard [on the other side of the room] was one of the main inspiration for this room. I wanted black elements in my office, since computers and screens are so often black. Frozen Ape Tempo. 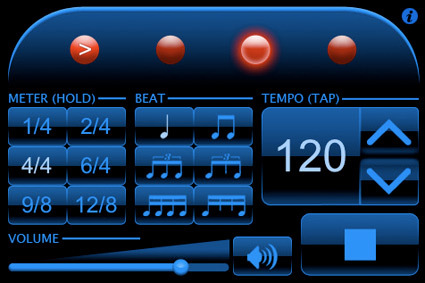 We got rid of our metronomes recently after discovering this iPhone application. It’s actually better than all the metronomes we had in the house. My favorite feature of the program is that I can plug my earphones into the audio jack and have the beats pulse straight into my ear. The program is 99 cents. Yet again, my iPhone replaces a unitasker. Storage boxes for strings. 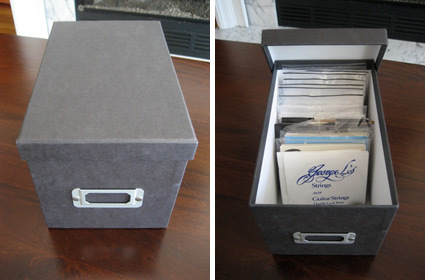 A few years ago, we noticed that a CD storage box is the perfect size for holding spare strings. We buy strings online at a discount, so it’s nice to have a permanent place for them to reside until we need them. And, since 10 of our instruments have strings, we regularly need them. Self-binding sheet music. After years of having sheet music strewn around the house causing a mess, we reached our breaking point. 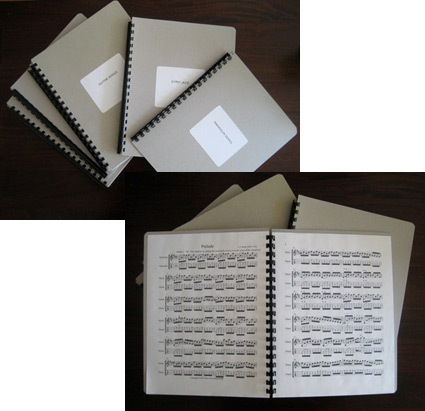 We sorted the sheets of music into piles and then used a CombBind C55 at the office to bind it all into nicely bound books. We created an index for the front of each book and store the bound music on our bookshelves. No more loose papers, simple storage, and it took us less than half an hour to create. If you don’t have a binder in your office, they do the same service at Kinkos for a minimal fee. Repurposed decorative items. On a table in our music area we have some candles and a decorative jar. We purposefully bought a decorative jar that has storage space inside of it so that it can have multipurposes. Now, this pretty little piece of art holds my harmonicas, castanets, and a case for guitar picks. What tricks do you use in your music room to contain the numerous supplies that come with instruments? We’re always on the lookout for solutions, so please share your ideas in the comments. Love them or loathe them, electronic party invitations are very convenient. To me, they are what you use when a paper invitation is too formal for the event (drinks with friends, coworker’s birthday celebration in the conference room), but you want people to know that you put some level of planning into it (ordered an ice cream cake, spent all day Saturday cleaning the bathrooms in your apartment). They save you time from having to pick up the phone and call every one of your friends. A new player has jumped into the electronic invitation market, and it is MyPunchbowl. It has all the same features as Evite, and the added benefit of the invitations actually looking like invitations. Both Evite and MyPunchbowl can save you time and money when you want to invite people to a casual event. When I think about cooking out on the grill, I think about hotdogs, hamburgers, steak, corn, asparagus, kebobs, bratwursts, and peaches (mmmmm, grilled peaches). Want to know what I don’t think about? Meatballs. Williams-Sonoma has once again created a solution (the Meatball Grill Basket) for a problem that doesn’t exist. People the world over were just fine cooking their meatballs on the stove or in the oven. No one was crying late at night, gnashing their teeth, wishing that someone, somewhere would create a giant contraption for the specific purpose of grilling meatballs. But now, NOW!, you can drop $50 for this item that you have no use for owning. Honestly, if you really wanted to grill meatballs (and again, why would you?) all you have to do is add a bit of egg to your meatball mixture and you can set meatballs directly onto the grill grates, same as a hamburger. 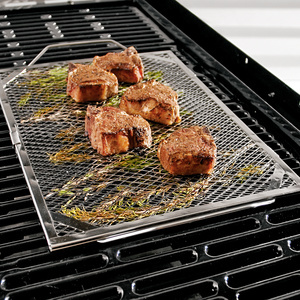 If you want meatballs smaller than your grill grates, simply set a metal cooling rack (make sure it’s just plain metal) onto your grill grates and then cook your meatballs on the smaller-grated cooling rack. (It will look kind of like this.) A metal cooling rack has a dozen purposes and costs less than $7. Wow, I wonder how many of these Meatball Grill Baskets Williams-Sonoma is going to sell?? Unbelievable. Organize magazine is no longer taking subscriptions. My grandmother was old enough to remember being a child in Pittsburgh during the Great Depression. Here at Unclutterer we highlighted his bit on “Stuff” from his 1986 Comic Relief performance. So you’ve wanted a pool table ever since your parents said you don’t have room for one. If you’re a part of a mismatched couple, how can you find a way to more easily live with your messy partner? Peter Walsh took time out of his busy schedule to participate in an interview with Unclutterer.com. Switch purses often? Then you have no doubt been faced with the problem of missing items that results from switching the contents of your handbag in a hurry. Well, here’s the solution.